At the 2017 American Society for Cell Biology Meeting held in Philadelphia Pennsylvania, Amy Prunuske, Ph.D. a faculty member at the Medical College of Wisconsin and University of Wisconsin–Stevens Point students presented a poster on their work detecting pathogens associated with ticks using the Biomeme two3 and the Tick + Pathogen Panel M1 Go-Kit. 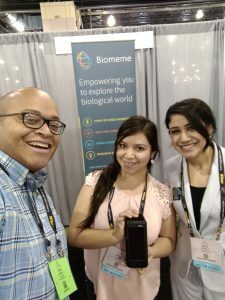 Study authors Jhomary Alegria-Berrocal (center) and Mona Alhalal (right) posing with the Biomeme two3 alongside Biomeme staff member Doug Watts (left) at the The American Society for Cell Biology Meeting 2017. 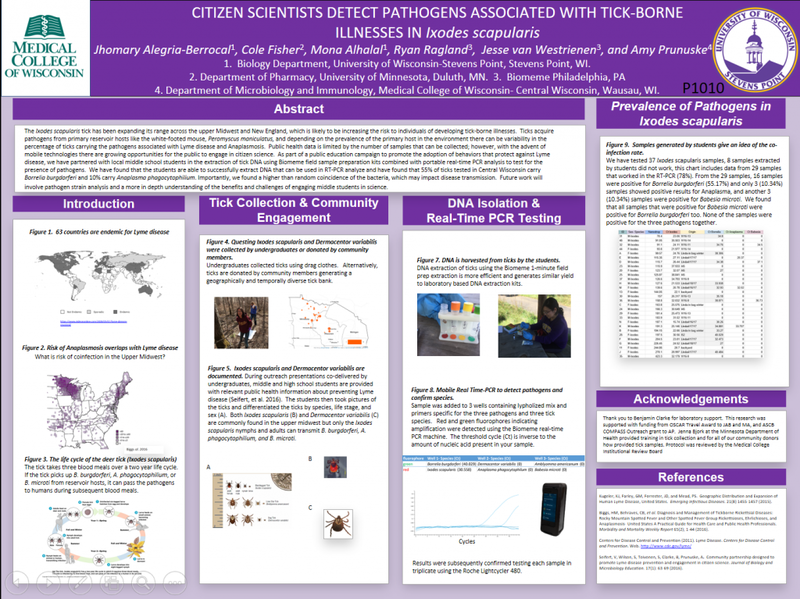 The poster’s full title is, “CITIZEN SCIENTISTS DETECT PATHOGENS ASSOCIATED WITH TICK-BORNE ILLNESSES IN Ixodes scapularis“. Check out the full poster below, for more information about this project.